This article is meant to reconcile two schools of intellectual thought regarding tort law, the conceptualist and the anti-conceptualist. It argues that torts must be understood as a system in perpetual process--forever indefinite and infinitely malleable in its precise theoretical, doctrinal and practical manifestations--yet ultimately bounded in its possibilities. It then defines the limits of torts law as a process that constantly regenerates the old face of tort theory, doctrine and practice into the new. 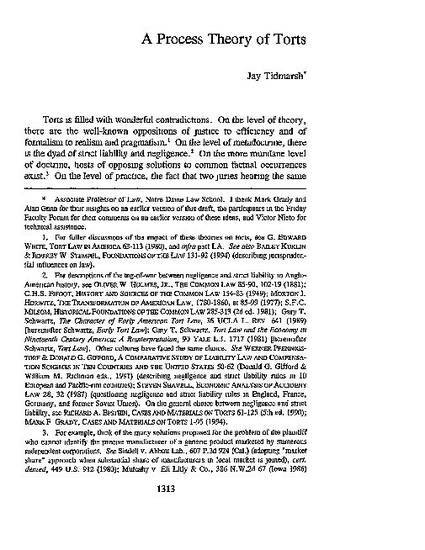 This article was originally published as Jay Tidmarsh, A Process Theory of Torts, 51 Wash. & Lee L. Rev. 1313 (1994), and has been reproduced with permission.